In 'wires' made from graphene, essential electronic components (such as diodes), can be incorporated with atomic precision. This results in a functioning electronic circuit with super-fast conduction. Chemists from the Utrecht University, Holland have, in cooperation with researchers from the TU Delft and the University of Aalto (Finland), demonstrated this. 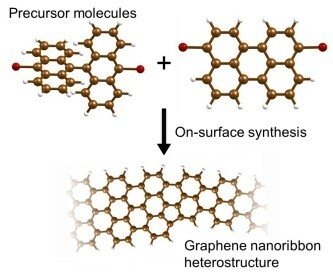 Because of the many attractive characteristics of the 'wonder material' graphene, there is industrious activity everywhere to find ways to bring these to actual practical use. The problem is that graphene itself does not inherently possess any characteristics that allows it to switch electrically (for example between on and off). And this is now the exact problem that these researchers have found a solution for. 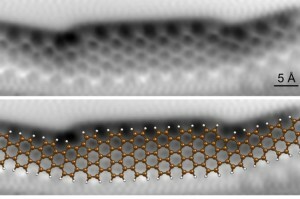 The starting point is formed from so-called nano ribbons (nano wires) made from graphene. It was already known that the electronic characteristics depend on the atomic width of the ribbon. With a width of five atoms it is an ordinary (even a very good one) conductor. However, with a width of two atoms the ribbon changes into a semiconductor. The researchers succeeded in joining wires with a width of 5 atoms seamlessly to a ribbon that is 7 atoms wide, resulting in a metal/semiconductor junction – that is, a diode. The electronic graphene structures were created with the aid of a chemical reaction: the evaporation of the initial materials and then allowing those to be deposited on a gold crystal. This chemical 'route' ensures that the structure on an atomic scale is perfect. Through evaporation and deposition the desired structure is formed (illustration: P.H. Jacobse a.o., Utrecht University).